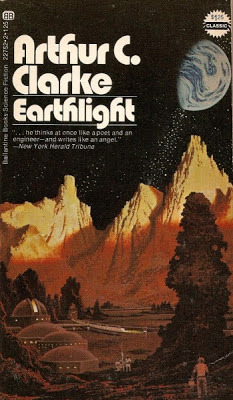 Here's the rest of the Arthur C. Clarke's classics you can download on the cheap! You can get your hands on Earthlight for 2.99$ here. Two hundred years after humans first touched down on the surface of the Moon, there are permanent settlements there—as well as on Venus and Mars. The inhabitants of these colonies have formed their own political alliance: the Federation. On the Moon, a government agent from Earth is hunting a suspected spy at a prominent observatory. He is caught up in the larger political struggle between Earth’s government and that of the Federation, and ultimately must struggle for his life—in the beautiful and barren landscape of the Moon under Earth’s light. You can download The Fountains of Paradise for 2.99$ here. Renowned structural engineer Dr. Vannevar Morgan seeks to link Earth to the stars—through the construction of a space elevator connecting to an orbiting satellite 22,300 miles from the planet’s surface. The elevator would lift interstellar spaceships into orbit without the need of rockets to blast through the Earth’s atmosphere—making space travel easier and more cost-effective. Unfortunately, the only appropriate surface base for the elevator is located at the top of a mountain already occupied—by an ancient order of Buddhist monks who strongly oppose the project. Morgan must face down their opposition—as well as enormous technical, political, and economic challenges—in order to make the project successful. Winner of the Nebula and Hugo awards, this novel combines believable science based on the knowledge of the time with heart-stopping suspense—sure to delight science fiction readers and fans of Clarke alike. You can also get your hands on Death and the Senator for 2.51$ here. Martin Steelman is a senior United States Senator. From the get go, he has been aiming for power and the Presidency. In pursuit of his goal he has sacrificed friendship, family, marriage, and more. Now he is faced with a terminal medical condition--a cardiac condition--that is incurable and from which he will die. With nowhere to go, Steelman must face his fate and the end of ambition that follows. He determines to attempt reconciliation with his divorced wife, his estranged daughter, and his grandchildren--the only real family he has ever known. Then the unexpected occurs and Steelman finds there may indeed be a cure, one that can only be administered in the weightless environment of the Russian space station--a treatment that is offered to Steelman through the State Department and the Russian Government. The moral quandary is that decades earlier, Steelman had been instrumental in killing off a similar orbital space program for the United States, calling it an egregious waste of public funds. Now Steelman comes to understand that if he accepts the treatment he will forever be known as a hypocrite. More, should Steelman take the treatment, he may be displacing others who are more worthy of the new treatment. So it is that Steelman finds himself at the moral crossroads of his life.